Elvis was a keen car man, particularly Cadillacs, as you will see with some of the cars featured in this Elvis Car Collection of some 30 cars kept at his famous Graceland Mansion. Reporter Tom Brown is taken on a guided tour of cars Elvis owned including his all time favourite the pink 1956 Cadillac. This car is very much original with the spare tire still in the trunk and never been used. We also see the 1973 Stutz Black Hawk, a rare and beautiful car that would no doubt fetch a mint if ever put up for auction. A very heavy car at around 5000lbs it had a top speed of 130mph, was built in Italy from 1971 to 1987 on a GM platform ,the Pontiac Grand Prix running gear was used with initially the 455 cub in V8. Production was up to 6 per month and these were snapped up by many movie stars and entertainers, and by 1987 total production was up to aprox 600. 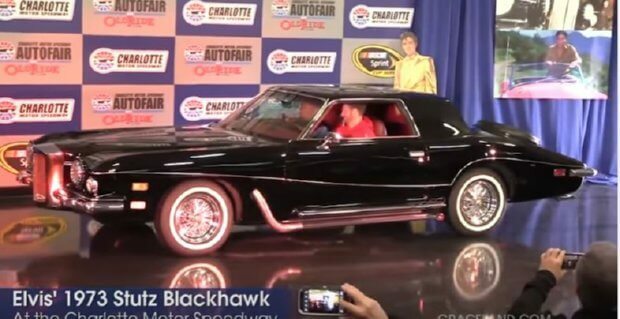 Elvis is reported to have owned at least 4 Stutz Black Hawks. No doubt there are a few of these sitting hopefully in barns, waiting to be discovered. For the readers who are Elvis fans there are several early photographs and video clips of Elvis in and around Graceland. Plus there is of course the ongoing controversial subject is Elvis really dead, or is he still alive but keeping out of sight in the guarded upstairs floor of Graceland where two family members only are allowed. If this were true I certainly wouldn’t blame him for this, his life particularly after he completed his period of Army service would have been hellish and almost entirely responsible for his death if / when this occurred. Recognise this dashboard on this car of Elvis’s? The answer is on the speedo. Thanks to Tom Brown, Graceland and Wikipedia. Photos are video screen shots.